To me, that was a worthy field trip. After that, I saw Great Blue again at two other field trips, Big Creek GreenwayFulton County) and Henderson Park (Dekalb County). Unfortunately, this bird was either too far away from me and there was no chance for me to get even one shot or it was just disappeared within a blink of eyes. After finishing my last Saturday's field trip at Chattahoochee Nature Center, one birder (Mark McShane) suggested that he would like to head south to see some waterfowls at E.L. Huie water facility in Clayton county. I decided to follow him there since this would be my first time to E.L. Huie birding site. But again, thick clouds were coming over and it started raining on our way to E.L. Huie and I was praying with high anticipation. As we got there, the first few birds came to our view were Double-crested Cormorant and Hooded Mergansers. Then this huge Great Blue Heron expanded his wings and flew over my head. It was absolutely stunning! Later, I was luckily to see three more Great Blue Herons. 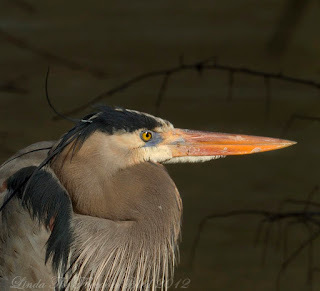 While I drove my car from one pond to another (there are total 6 ponds in E.L. Huie Water Treatment Facility), I spotted this Great Blue landed about 30 feet behide my car. I stopped my car and slowly opened door, and crazily took few pictures. This photo is still not satisfactory to me but I am happy for now since I finally, have a full body shot of a Great Blue Heron!